Home Latest Drainage News & Offers What is the best septic system for clay soils? What is the best septic system for clay soils? 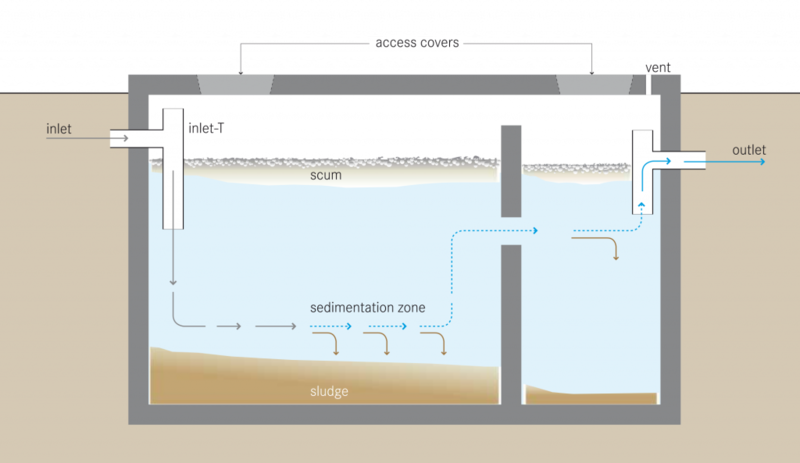 In a septic system waste is separated into three layers with one layer being treated and leaving the tank, as you can see in the diagram below. This is drained to a soakaway or drainage field via the outlet pipe and the rest of the contents of the tanks stays put as ‘sludge’ until regular emptying, known as desludging. Clay soils can be troublesome for septic systems as it’s not the ideal soil for absorbing and cleaning water. 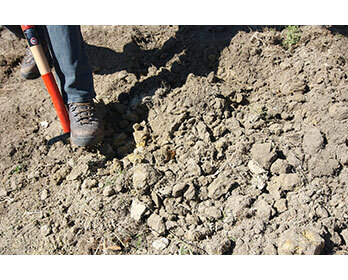 How do you know if you have clay soil? You can work this out by asking yourself what your soil looks like in hot or wet weather conditions. If your garden stays logged with water for a long while after heavy rains then you may have clay soil. If your garden becomes extremely hard and very dry after a hot spell then this could mean clay soil too. The best thing to do is to carry out a percolation test. If you’re pretty sure that you have clay soil then a percolation test will confirm this for you. The image on the right is of condensed clay soil. What’s the problem with clay soil and septic tanks? A septic tank drains a third of its contents away into a soakaway or a drainage field. This is so that as the water passes through this system it gets partially cleaned by soil because it passes through small gaps in the soil, leaving any debris or unwanted items in the ground. In clay soil there aren’t big enough gaps between the particles in the soil to allow water to pass through (hence the dry baked ground in hot weather, and water-logged garden during rainy spells). These tiny gaps in clay soil stops the water passing through and from getting treated. The water cannot go anywhere, despite being pumped out of the septic tank, and this leads to dirty untreated water creating a sodden path around the tank. The septic tank will more likely than not back up too as the water struggles to leave. What are the alternatives to clay soil septic tanks? What’s the best septic system for clay soils? Clay soils do not support soakaway systems so avoid any septic system or sewage treatment plant that utilizes these. If the location of your system is close to a watercourse like a lake, river, stream or canal then we recommend upgrading your septic tank to a sewage treatment plant. High level sewage treatment plants produce a quality of water that’s clean enough to be pumped straight into a water course. Double-check with the Environment Agency that this is okay though, you don’t want to be hit with a fine if your watercourse is a rare exception to this rule. Our recommendation for if you’re not close enough to a water course would be to try an aerobic sewage treatment system which expels a higher quality of water than anaerobic (traditional) sewage treatment plants. This water is clean enough for use in surface irrigation so if you have a lot of land (common around off-mains properties) you can simply expel it into this.